Gmail is my choice email web application and I write a lot about it here. In this post, we are going to look at 3 different ways of detaching Gmail from your browser and running Gmail as if it were a desktop application. GeeMail is an Adobe AIR app that is brand new. It lets you access Gmail right from your desktop without opening a browser. For those unaware, Adobe AIR is a new technology that lets developers run web applications via desktop apps. Some of the most popular ones are Twitter client like Twhirl, Adobe Kuler, etc. GeeMail misses the most used feature in Gmail for me – Search. Plus, the labeling feature is also missing when you are offline. Gmail web does provide offline access with the help of Google Gears but it takes a while to set up initially whereas GeeMail was lighting fast. But, the interface is very fast and I am using GeeMail to keep an eye on one of my less frequently used Gmail accounts so I don’t miss the shortcomings I just mentioned as much. Also, I didn’t have much luck running it from behind a proxy but works like a charm when connected straight to the Internet. 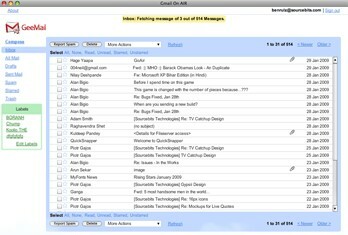 Another Adobe Air app that can run Gmail on your desktop is GMDesk. Prism (review) is a Mozilla Labs project and I love it. I run a multitude of web applications from my desktop via Prism. You can take a look at some of the best Prism apps here. Prism lets you detach any web site you want to a desktop window. And web applications such as GTalk gadget, Remember the Milk, PassPack, etc. make the perfect candidates as you hardly use the browser navigation buttons at all. In fact, Prism has the advantage of giving you the full featured Gmail web interface in your desktop without any shortcomings. You can create a desktop shortcut for Gmail Prism app and access it just like any other desktop app. You can run Prism in 2 ways. Either grab the Prism application that ets you cnfigure any web application as a Prism app. Or if you are using Firefox 3, you can use the Prism Firefox extension to detach any website to your desktop as a Prism app. The only downside I see with this is the lack of solid support for Firefox extensions in Prism. You will miss out on the best Gmail Greasemonkey scripts and Gmail Stylish scripts out there. Google Chrome is a Windows-only (at the moment) browser from Google. It is pretty impressive and fast. But, the lack of extensions is what made me stick with Firefox. But, Google Chrome (review) has a Prism like feature that lets you create web application shortcuts in your desktop. Google Chrome uses Google Gears to power this feature. While browsing any site, you can create a desktop shortcut easily and from then onwards access the web app from the desktop. Gmail is a perfect candidate for this purpose and you don’t have to fire up a browser to access email. Gmail has just stepped up its game in the web based email with their Gmail Labs features that keep introducing new and compelling features very fast to us. If you found one of these tips useful, let me know how you are using it in the comments. Cool! Very helpful information. Thanx a lot. Wouldn’t it be easier to just install the bat! or any other email client and use this for your gmail account(s)?